Miele Australia has introduced a new range of washer dryers that combine excellent function with great convenience, efficiency and style. The new Miele WT1 Washer-Dryer series includes the WTH 130 WPM model with a 7kg load for the wash cycle and 4kg load for drying, as well as the WTZH 730 WPM model with an 8kg load for washing and 5kg load for drying. Regardless of the model, the feature-packed Miele WT1 Washer-Dryer series ensures 4kg of laundry can be immaculately washed and dried in less than 3 hours without any manual intervention. Miele’s integrated TwinDos automatic detergent dispensing system helps achieve detergent savings of up to 30 percent, thanks to accurate auto dispensing . The automatic detergent dispensing feature has been verified as the best liquid detergent system on the market . By integrating a washing machine and dryer in the same unit, Miele WT1 achieves space-saving practicality, while providing the performance and convenience reflected in the current W1 and T1 ranges of laundry appliances. Thanks to the Miele PowerWash 2.0 process, the WT1 series sets the standard with short cycle times: 4kg of laundry can be washed and dried in less than 3 hours, without any unloading or other manual intervention. 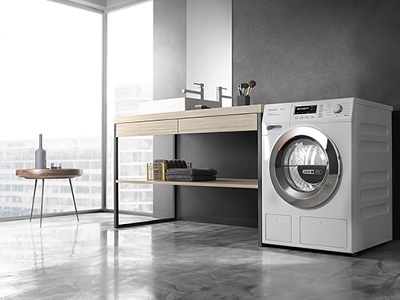 For 5kg of laundry, the WT1 requires less than 3.5 hours in the WTZH 730 model. The PowerWash 2.0 feature wets the laundry faster through spray action, short interim spin cycles and precision load-dependent controls, minimising the use of water in the process. Additionally, less energy is consumed, particularly when washing less-than-full loads. In addition to the integrated TwinDos automatic detergent dispensing system in the Miele WT1 series, further user convenience is afforded by advanced features such as the Delay-Start Function as well as the Programme Manager, which allows programme customisation; SteamCare, which reduces the need for ironing by up to 50% or can freshen up briefly-worn garments; the Miele Honeycomb drum that gently handles garments as they glide on a thin film of water; and CapDosing for dispensing of portioned capsules for garments that require special care such as woollens and down-filled items or simply fabric conditioner. The WTZH 730 WPM model can also be connected to the Internet via the home's wireless network using the [email protected] app without any proprietary hardware, allowing the user to conveniently access information on machine status remotely. The WT1 series is available from Miele Experience Centres and Miele Authorised Retailers nationally as well as the Miele online shop. Miele WTH 130 WPM has an energy rating of 4 for washing and drying, and WELS rating of 4 for washing. Miele WTZH 730 WPM has an energy rating of 4 for washing and 4.5 for drying, and WELS rating of 4 for washing. According to Oko-Institut e.V.report dd. 06.09.2013: “Potential savings with automatic TwinDos dispensing on washing machines”. German Hohenstein Test Institute Test No: HL 13.2.10991.